Florida Democratic gubernatorial candidate and Tallahassee mayor, Andrew Gillum, conceded the race for governor at 11 p.m. on Tuesday. Gillum lead a masterful campaign. The margins were incredibly close. So close that the community gathered, along with his camp, to ensure that he could get a recount, and, as of Thursday, it’s headed in that direction. The initial call to action, which began at 10 a.m. on Thursday, was to cure issues with provisional ballots because of the sheer number of them. With the Bill Nelson/Rick Scott Senate race so close, as well, it was imperative that every vote be counted. A campaign office in Orlando was one of the main locations where volunteers showed up to help in every capacity. 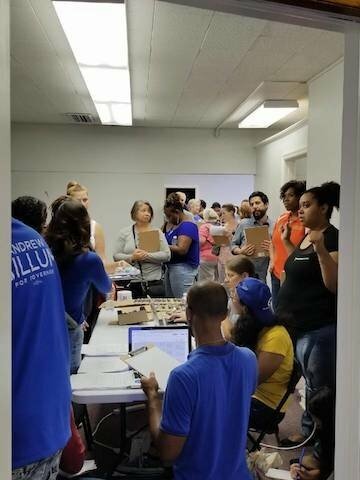 People that worked directly on the Gillum campaign were there as well Nelson supporters. There were well over 400 volunteers across the building’s threshold. It was the power of social media. A bright, creative social media director/ influencer of a nonprofit organization with a grassroots community organizing background, Sili Recio, was a main player at the Orlando location. Recio was crucial in creating social media awareness so the people who voted via provisional ballots would truly have the opportunity to have their votes counted. “I showed up to volunteer in whatever capacity I was needed in. Social media is my specialty so, I started by coordinating for some images to be created in order to get the word out and provide those that had voted via provisional ballot with the information they needed in order to ensure that their ballot was cured,” Recio told DiversityInc. An unnamed supporter at the office, a gentleman who was undergoing chemotherapy, stood out among volunteers. Despite his physical condition, he shared a message of hope, persistence and love. He said this was too monumental of a movement to miss. His inspiring effort became even more incredible when he shared all eight pages of the late Martin Luther King Jr.’s “I Have A Dream” speech with the rest of the group. Another volunteer, Sabrina, put in hours of work. Ironically, she didn’t even live in Orlando. Sabrina had just flown in for a conference, heard about what was being done with reference to call to action and drove to the site straight from the airport.